From mowing grass to trimming brushes to plant replacements to annual change-outs to re-designs, Evergreen Total Landscape has been trusted with every aspect of commercial lawn maintenance since 1983. What has always set us apart from the competition is our active management approach. We have a project manager present at every job site who supervises the crew to ensure everything is done to the property manager’s wishes. In the unlikely event that a problem does arise, we provide property managers with all the information they need and get it taken care of quickly and efficiently. All of our lawn maintenance services also include fertilization and pest control, so property managers can rest assured knowing that their land will get the complete treatment. 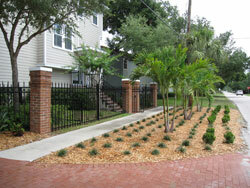 We even have the knowledge and expertise to re-landscape older properties with tired or dead plants. For more information on our commercial landscape lawn maintenance, or other services, please call or e-mail us today. We proudly serve customers located throughout the Tampa Bay area, including Clearwater, Seminole, Lakeland, St Petersburg, and beyond.